I have more than 100 images in my slider. I noticed that it loads all images on start and makes it very slow to operate unless all the images are loaded. Is there a way to stop loading all the images but just the one which is at the start? We have purchased the enterprise version today. Need you help with an issue. We are trying to initialize the slider dynamically on a button click. In this case the content of a div are loaded as below on the button click and we want to initialize the slider after that. Can you please help in how to do that? A demo for this question is at https://amazingslider.com/demo1/index.html. To check the code, in Google Chrome, you can click menu View -> Developer -> View Source, and view the source code. 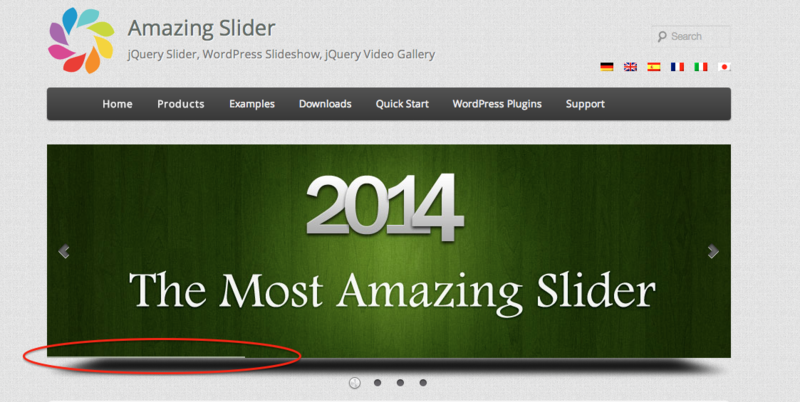 It's because in our demo, the amazingslider.js file is located at https://amazingslider.com/demo1/sliderengine/amazingslider.js. Hi, where is the code I am to paste into my web site? The generated slider.html is blank. I am using a Mac. On Mac, if you directly open the slider.html with TextEdit, it will look blank. It's because TextEdit on Mac is not a plain text editor or HTML editor. If you want to use TextEdit, you can follow this tutorial to make it as an HTML editor: http://mac.tutsplus.com/tutorials/productivity/quick-tip-configure-textedit-for-coding-html/. 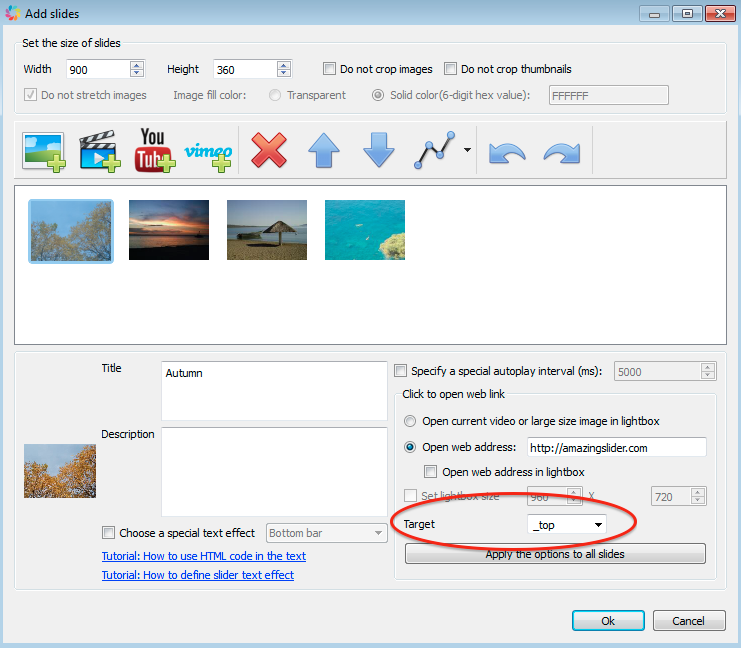 Then you can use it to open the slider.html file and copy the HTML codes. You can also download the freeware TextWrangler from Mac AppStore: https://itunes.apple.com/au/app/textwrangler/id404010395?mt=12. It's a much better option. Is it possible to use a local video (non-youtube) that has been uploaded to the site's root directory rather than a youtube link? 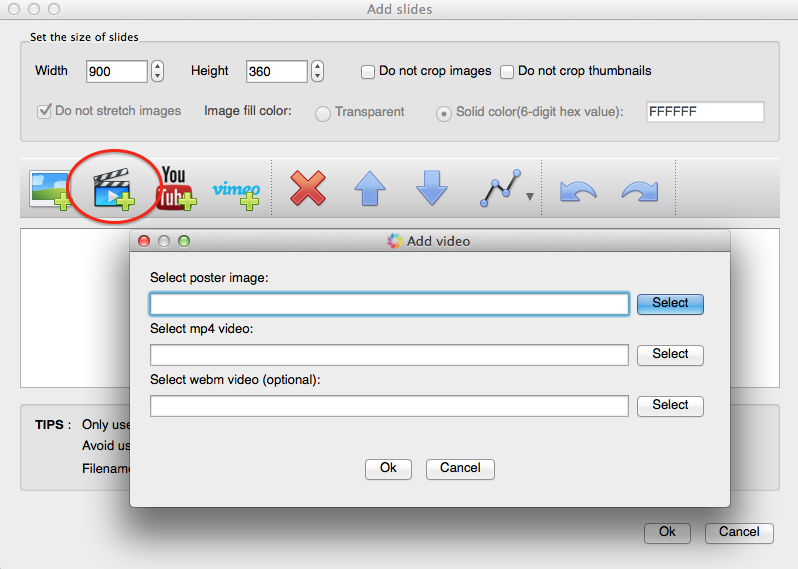 In the application, step 1, Add Slides dialog, click the button "Add Video", you can add your own mp4 video file.